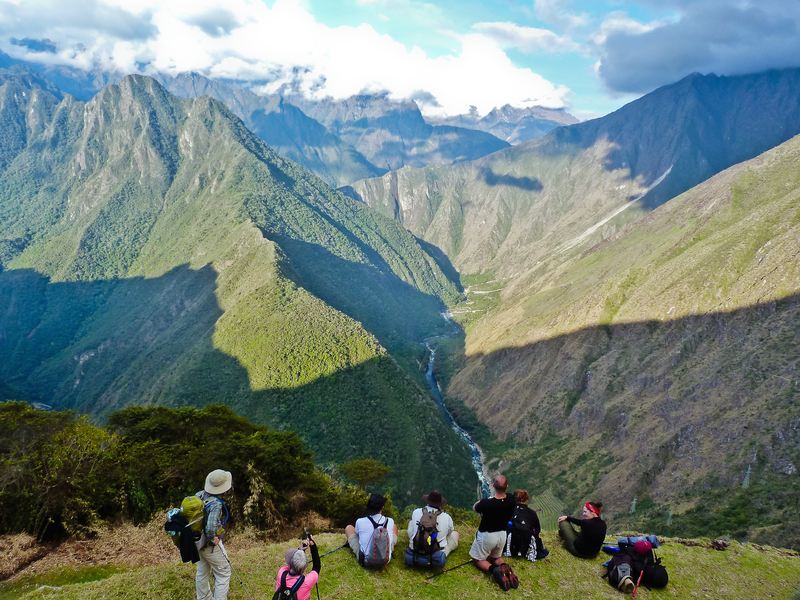 Hikers enjoy a well deserved break as they gaze out at the valley below the Inca ruin of Intipata, the Urubamba River flowing far below. This was taken near the end of Day 3 of the Inca Trail and is one of my favorite memories of the entire hike because it was the first time I had a few moments to relax and savor my surroundings. In some ways Intipata was almost more special than Machu Picchu because only hikers of the Inca Trail had the opportunity to visit it, and those of us who chose to visit Intipata rather than the more popular Winay Wayna practically had the entire place to ourselves. It was a nice, peaceful way to unwind after three days of hard hiking, knowing that the hardest part was over and that in the morning we would be standing at the Sun Gate enjoying our first view of Machu Picchu.